Absolutely the best pork loin recipe I’ve ever made! 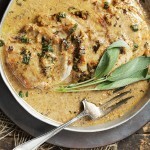 This Pork Loin with Wine and Herb Gravy is cooked with wine, garlic and herbs, then sliced thin with a beautiful gravy. This pork is easy enough for any night, but also a company worthy dinner dish! Let’s face it. We all need a break from chicken once in a while. So I think pork. It’s the other white meat. But pork, true … is sometimes a little boring. Well not any more! If you’re not one already, this dish will turn you into a pork lover. I guarantee it. It’s the best pork loin recipe! What is the difference between a pork loin and a pork tenderloin? Most people are familiar with pork tenderloin. It’s the small, long, thin and boneless cut of pork that’s popular for it’s quick cooking and a lovely tender meat. Pork tenderloins come from the side of the animal. A pork loin is different from a pork tenderloin. While it shares the “loin” name, it is a completely different cut and comes from a different part of the animal – the back. Pork loins are larger and thicker. Pork loins are roasts, intended to be be cooked low and slow. Because the loin (back) area is large, there are several different loin cuts that you will find at the grocery or butcher, depending if the roast is cut from the end or the center. Probably the easiest way to understand the difference is to think of pork the same way you think of beef. Pork tenderloin is equivalent to beef tenderloin – small, tender and meant to be cooked hot and fast. Pork loin roasts are like beef roasts. There are a number of types of roasts, depending on where the cut is from and which one you use will depend on what you are making. I made this with a small, center cut pork loin roast. Look for a pork loin roast that is labeled “center cut”. 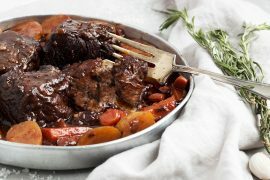 It is lovely solid, tender meat, with little to no fat in the meat itself. Think of it as the equivalent to a sirloin beef roast. Nice when you want a solid, tender slice of pork. Look for one with a little bit of a fat cap (1/2-inch or so) is nice, if you can find that, as it will keep the meat moist and add great flavour to the gravy. I you prefer, you could use a pork tenderloin for this recipe. 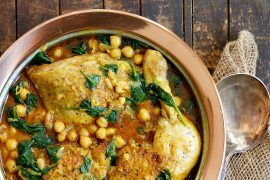 It will cook much more quickly (probably in about 30 minutes) and to be honest, you will kind of not get the full flavour experience with the shorter cooking time, but it’s a great alternative if you want dinner sooner. Get the biggest pork tenderloin you can find. 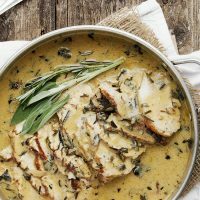 There’s also fresh herbs and while I’m usually flexible with swapping out dried herbs for fresh, this is one recipe where you really want to use fresh. When you smell it cooking, you’ll understand why. Heavenly! And there’s no way that dried herbs can compete with that. It’s worth it just for the smell while it’s cooking, but the way they flavour the meat and the finished gravy is one of the nicest parts of this recipe. I know some people don’t have, drink or cook with wine. If that describes you, this may not be the recipe for you. It has a lot of wine in it and it’s so critical to the flavour, I honestly can’t think of a suitable substitute. 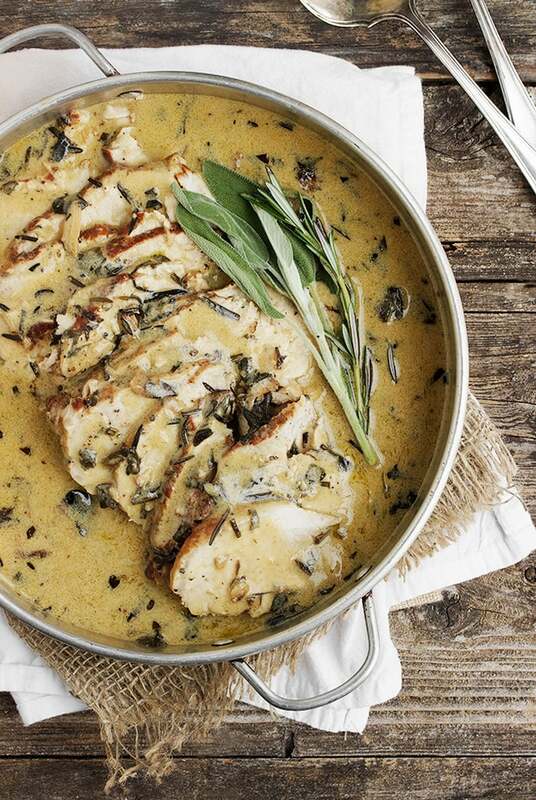 This one is all about the wine and fresh herbs. As for the wine, use a decent one (maybe not the part-bottle that’s been at the back of the fridge for a few weeks and yes, I’ve been guilty of doing that ;) Crack open a fresh bottle, one you love to drink. My son, after tasting this dish, thought a California chardonnay would be a perfect choice. Since he’s the budding sommelier in the family, I’d take that as a solid recommendation, if you don’t already have a favourite white wine you’d like to use. So now that I’ve said all that, I guess it’s obvious that this isn’t a quick, weeknight meal. That said, it’s not a huge time investment either. 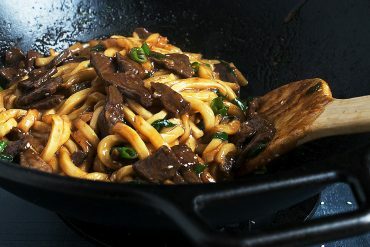 It does require peeking at it a few times as it cooks on the stove-top, but other than that, it’s an easy one-pot meal. It’s perfect for a weekend dinner or entertaining. As for what to serve with it, creamy mashed potatoes would be nice or buttered noodles. I’m tempted to try it with gnocchi too, for some reason. Or forgo the carbs and just enjoy it with a nice green veg. 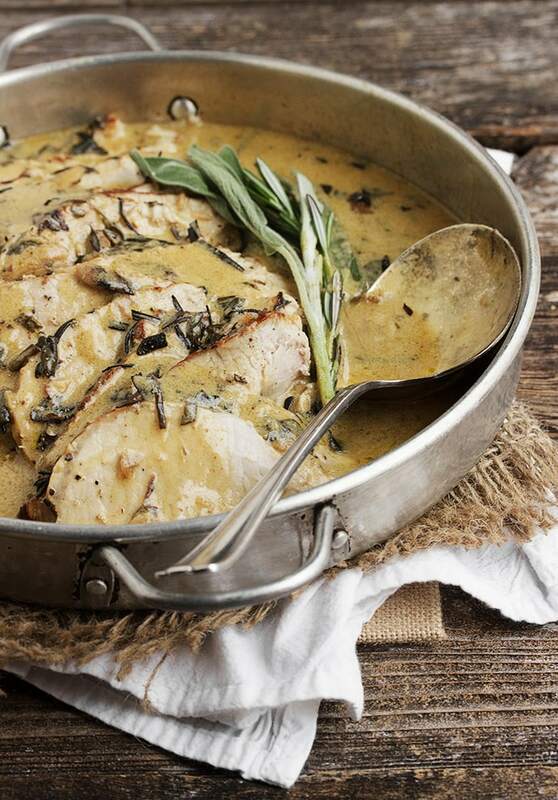 Pork loin (or tenderloins) cooked on the stove-top with wine and herbs, then sliced and served with a delicious, lightly creamy gravy. If using a pork loin roast, look for one with a little bit of fat. For pork tenderloins, be sure to trim the silverskin before cooking. Heat the oil in a large Dutch oven over medium-high heat. Saute the pork for about 5 minutes on each side, then remove it to a plate. In the same pan over medium heat, saute the garlic, rosemary and sage, stirring, for about one minute. Add the wine to the pan and use a wooden spoon to scrape the bottom of the pan. Cook until the smell of the alcohol has disappeared, about 1 to 2 minutes. Lower the heat under the pan to low-medium heat. Return the pork to the pan and season with salt and pepper. Partially cover with a lid and cook for about 1 1/2 hours (considerably less if you're using pork tenderloins instead. Rely on a thermometer to check for doneness), flipping the pork and scraping the bottom of the pan every 20 minutes or so. Keep an eye on it, making sure there continues to be some liquid in the pan. Add 1/4 cup of warm water if necessary. When the pork is cooked through (if you want to test with a thermometer, it should be about 140-145° internal temperature.) Remove pork to a cutting board to rest and cover with loosely with a sheet of aluminum foil to help retain the heat while it rests. Meanwhile, increase the heat under the liquid in the pan to medium. If your pan has little liquid, deglaze with a splash of white wine. Stir well to loosen the browned bits on the bottom of the pan. Allow to cook until the alcohol smell disappears (about 1-2 minutes). Add the chicken stock and stir to combine. Heat over medium heat a few minutes, to allow the chicken stock to heat through a bit. Reduce heat to medium-low. Add the cream. Heat gently over medium-low heat, stirring the sauce constantly, until it thickens a bit and is warmed through. Avoid vigorously boiling. A gentle simmer is fine. (*If your sauce doesn't thicken up, mix 2 Tbsp. cornstarch with 2 Tbsp. water and add a bit at a time to your sauce until it thickens to your liking.) Taste sauce and add salt and freshly ground pepper, to taste. When the sauce is ready, slice the pork very thinly and place on to a serving platter. Pour the warm gravy over-top to serve. If you are a fan of pork loin, you must try this one as well! It's pork loin, braised in milk, which may sound odd, but it makes the most tender pork with an absolutely delicious gravy! I never usually post comments, but had to because this was SO good! I made this on Saturday and loved it so much that I made it again on Monday! First time around I made it exactly as written in the recipe and it was amazing! The second time I made it I added a chopped shallot to the garlic and herbs and don’t recommend doing that, it was still good, but the flavor balance wasn’t the same. Lesson learned: don’t second guess Jennifer’s recipe! Best roast pork ever, thanks so much for sharing this! So glad you enjoyed it, Emily! It’s one of my favourites :) Thanks! I’ve been wanting to make this recipe ever since you posted it and finally did it! It is every bit as fabulous as all the other comments indicate. Plus it was a whole lot less work than what the end product would imply. I used a pork tenderloin cut in to two pieces so that it would fit in my pan. I used a deep skillet in place of a dutch oven and it worked perfectly. I always find pork tricky as it can dry out really fast but not with this recipe! Love the photos even more! Oh my!! This was delicious. I have been looking for some good pork recipes to add into the rotation and this one is a keeper. I kind of cheated a little because I had a preseasoned pork loin. I omitted the salt and pepper for that reason. But followed the recipe exactly other than doubling the gravy and I’m so glad I did! Thank you for this wonderful recipe. Holy Smokes!!! I made this for company for the first time! Was worried because it was a blind recipe…but OMG!!! Doubled the gravy, and because we eat keto, I thickened with xantham gum! Everyone RAVED!!!! Consensus was that it was the best pork loin they’ve ver had! You made me look like a SUPERSTAR!! Thank you!!! I absolutely agree with your very first comment on this recipe ….this truly is the best pork loin recipe I have ever made. I have am overwhelming desire to make tons of extra sauce and put it on everything…lol. I made with a 4.4 lb pork loin roast and cooked longer than stated because it just would not come up to temp! Finally it was done and the pork was a little dry but I could have licked the pan clean! The gravy was so good! Served with roasted sweet and Yukon gold potatoes and roasted Brussels. Even my picky 7 year old loves it! Any tips on cooking time for a larger cut of pork? Hi Sara, my best tip would be to cut the 4 lb pork loin in half and cook them side by side as 2 lb roasts. This stove-top method doesn’t lend itself to large cuts, as they take too long to cook through. Cutting in half replicates the recipe well, while still having more meat. My brother made this and it was amazing. 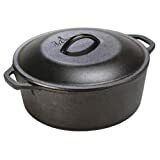 I do not have a Dutch oven could yiu suggest what I could use in its place? I’m so excited to make this recipe for Christmas dinner. I bought a 4.5 pound pork loin, which the butcher cut in half and tied with string. How would you recommend I change the cooking time? Thank you in advance. Hi Laura, I have never tried this recipe with that large a piece of meat. I think cooking time will largely depend on the thickness. I would definitely recommend using a meat thermometer and checking regularly, cooking until it reaches 140F. in the centre. Another option would be to cut the piece into two pieces and cook them side-by-side in the pan, in which case the cooking time would be pretty much per the recipe. Enjoy! I am really wanting to make this recipe. Do you think I could start this on the stove and finish in the oven? I also have a very large loin almost 6 pounds? Any suggestions? Hi Laura, that’s a big piece of pork, so I understand you not wanting to fuss with it on the stovetop. I think you could transfer to the oven (a low oven – 300-325F?) and duplicate the lid “ajar” (so don’t cover completely, but cover partially) and it would probably work out just fine. Just test regularly with a thermometer so you don’t over-cook the pork. Aim for 140F in the centre. Hope that helps :) Enjoy! Did you try this in the oven? 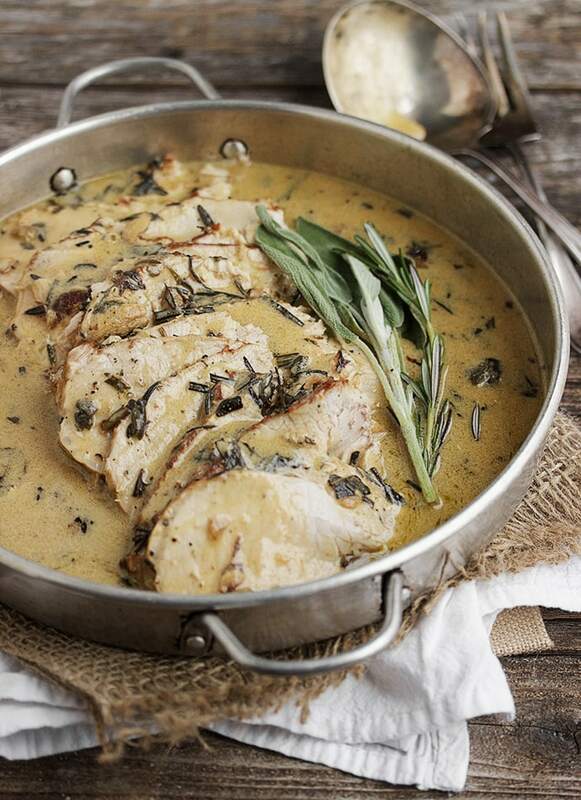 I also have a large pork loin I am wanting to use for this recipe. Thanks! I concur, this was so good! I followed the recipe exactly, except I added some dried sage because I didn’t have enough fresh. I did also thicken it, per the writer’s suggestion, with water/cornstarch. It was delicious and the gravy totally made it! Served with garlic mashed and roasted carrots. Definitely will keep this in rotation! So glad you enjoyed it, Tammy :) Thanks! I definitely approve of your decision to double the gravy :) So glad you enjoyed it! Thanks! So delicious! Next time I’ll double gravy. Served w roasted fingerling potatoes and roasted cauliflower. So glad you enjoyed it, Chris :) Thanks! Thanks so much, Alica :) So glad you enjoyed it! I made this tonight with garlic mashed potatoes and roasted carrots with herbs. AMAZING!! So glad you enjoyed it, Colleen :) Thanks! I prepared this a few weeks back and it was amazing! Prepared this on Thanksgiving as well, but swapped out the pork and used a 5 lb turkey (sans drumsticks and wings). Braised the bird on the stove and cooked uncovered in Dutch oven. While my husband carved, I whipped up the gravy in the Dutch oven. Served over mashed. The house smelled incredible! Planning this for Christmas as well! Thank you! Hi! I’m planning on making this for Thanksgiving lunch this year. But I’m having more than 8 people over, its gonna be between 12-14 people. Do you think I could cook 2 pork loins in one Dutch oven and just extend the time a little?? Hi Alison and yes, if you have a big enough dutch oven (that will allow a little space between the two roasts), just do the two at once and double the sauce. I’m feeling like the timing should be about the same, but test with a thermometer to be sure. Enjoy! I was undecided between using the loin or tenderloin. I went with the loin and so happy that I did. It was by far the best pork recipe ever!! The loin was so tender you were able to cut with a fork and the gravy was sooo tasty! Thanks for this wonderfully scrumptious meal!! I’m happy you did too, as it’s my favourite way to enjoy this dish! So glad you enjoyed it too :) Thanks! Definitely a 5 star recipe. The pork was good but the sauce is the winner here, I paired this with a brown rice pilaf and some green beans. Definitely make again, use fresh sage and rosemary if possible. Would go great with a potato mash as well. Thanks Don and yes, this one is all about the sauce :) So glad you enjoyed it! So glad you are enjoying it, Monica :) It is one of my favourite meals and I always serve it with potatoes, too! This is the BEST way to eat pork tenderloin. I made it last night and we didn’t have any leftovers. Recipe was easy to follow. Can’t wait to try more recipes off your website. Really, really good. Tender moist pork loin with a lot of excellent flavour. Five star recipe! Truly wonderful, fabulous, etc, etc, etc. great flavor. I did thicken the sauce to use as gravy on potatoes. I plan on making this next week for a dinner party. The guest of honor is a big fan of mushrooms. Do you think Chantelles or Criminis would work in this recipe? Hi Jennifer, I think mushrooms would work well with these flavours. I would definitely cook them separately though and add to the gravy at the end. Enjoy! Is there another way of cooking the loin than a dutch oven? Can it be baked or made in a ceramic skillet? Hi Renae, the unique method of cooking here doesn’t translate well. It cooks semi-covered, so roasting would be a different, drier heat and the herbs/moisture would probably brown or burn on the bottom of the pan, as it would evaporate too quickly. You could try a skillet on the stovetop, but you would need to “tent” it somehow, perhaps with foil. You want the moisture to stay around the roast, but not completely. Hope that helps. Yes, it’s hard to replace the depth of flavours from the long cooking of the original. 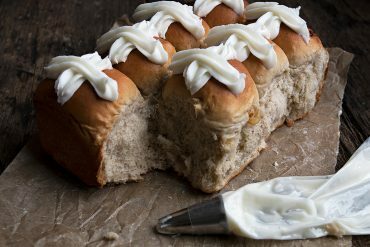 I LOVE this recipe, we have had it numerous times now, and can’t wait to host our friends with this on the menu! So glad to hear, Charlie. It is one of my favourites and perfect for entertaining. Everyone always enjoys it :) Thanks! I am cooking this right now. I think it is perfect alone without any sides, but what is your opinion on doing baked sweet potatoes as a side dish to go along with it. My fiance is a fan of side dishes so I had to come up with some. I made this recipe several weeks ago and it was amazing. I thawed out a frozen pork loin to make it again, but realized I wouldn’t have time to do it. I put it in the crock pot on low for 6 hours and it turned out amazing as well. I seared the pork and laid it on a bed of thyme and rosemary (the hubs bought the wrong herb) and garlic. Dumped some white wine in there and let it go to town. The taste was delicious, and the pork just fell apart. So great!!! Would it also be a good idea to marinade the pork loin? Hi Monika, I don’t think marinating is necessary. Pork loin is lovely and moist (as long as it’s not over-cooked :). And the sauce has lots of flavour, that cooks into the meat as well. This looks fantastic! I have red wine though. Would that be an okay substitute for the white wine or would it mess with the flavors? Hi Noel, I have never tried it with red wine, but my feeling is it would mess with the flavors. I would probably stick with the white wine. I made this for Easter Dinner, and I truly believe, it is the easiest, most flavorful pork recipe I have ever had. I sliced my pork prior to cooking because of my time element. It was so tender, cut it with a fork. I believe the fresh rosemary and sage from my herb garden, were just perfect to enhance the flavors and the presentation. So glad you enjoyed it! It’s a perfect dish for Easter Dinner :) Thanks! Sorry, forgot to rate it!! I wish I could give it 100 stars because it is that good! Omg I made this the other night and it was amazing!! There was so much flavor in the sauce and the pork was fork tender! It was amazing the next day for lunch too!! I never leave comments or reviews for ANYTHING but this recipe right here was phenomenal! 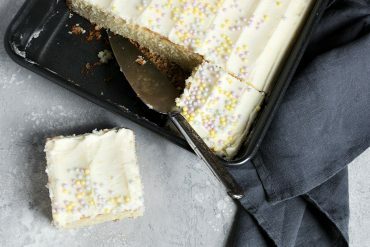 I just found your page last night and everything looks so delicious! I plan on trying more recipes. Do you have any must make dinner recipes that you recommend I try next? I love this recipe, and it’s hands down my favorite meal to make when company arrives, because everyone is impressed. Any chance you have an instapot version of it? 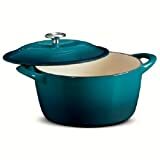 I just got one for Christmas and would like to try this dish in it. Thanks! I made the Pork Loin with Wine and Gravy after making the Indian Spiced Stew with Chicken and Potatoes, which I absolutely loved! 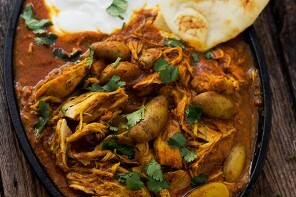 This was an excellent dinner and the flavours were rich and comforting. The only problem I had was that the herbs and garlic burned very badly when I was browning the pork loin. I didn’t let that discourage me. I simply spooned out the burnt stuff after removing the pork and added some new garlic and herbs at lower heat and cooked them up a bit before adding the wine. It still turned out wonderful. I also added a small spoon of flour after removing the cooked roast in order to have a slightly thicker gravy. Would definitely make this again, and it is elegant enough to serve to company. Thanks for the great recipes! Thanks so much Anna and glad you enjoyed this. One of my favourites :) And yes, it’s a fine line between searing and burning in this one. It’s happened to me the first time I made it as well and I did just as you did. I make sure to use my heaviest-bottomed pot now and watch it really close. Used a 3lb boneless pork loin roast & it turned out DELICIOUS!! The place smelled incredible as the roast was browning & lingered until the next morning. Best pork roast in ages! Think (actually know!) I’ve found my favourite receipe! 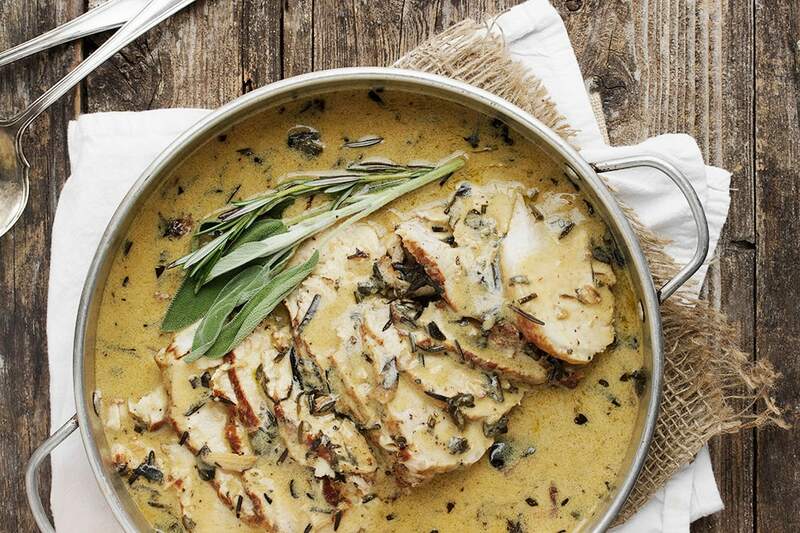 This was an amazing dish, the sage and rosemary add so much flavour to the sauce! Thanks for posting, my family loved it!!! I was wondering if I can do this in my crock pot? I have the ninja which also has the stove top option so I can follow it exactly – just wondering if I can then use my crockpot setting on slow cook and if so for how many hours on slow? Likely 8? Hi Lydia, The pork cooked per the recipe never gets covered. If you were to cook it covered for a long time in a slow cooker, you would end up with a very different piece of pork. It probably wouldn’t be sliceable. It would just fall apart. If you are looking for sliceable, I wouldn’t go the slow-cooker route. I made this tonight and my family was practically licking their plates–so good! I only had 1 dry bottle of white wine in the house and it was a special one being saved for an anniversary so I used a bottle of dry pear cider that I had, expecting it to go very nicely with the sage as well, and boy did it! 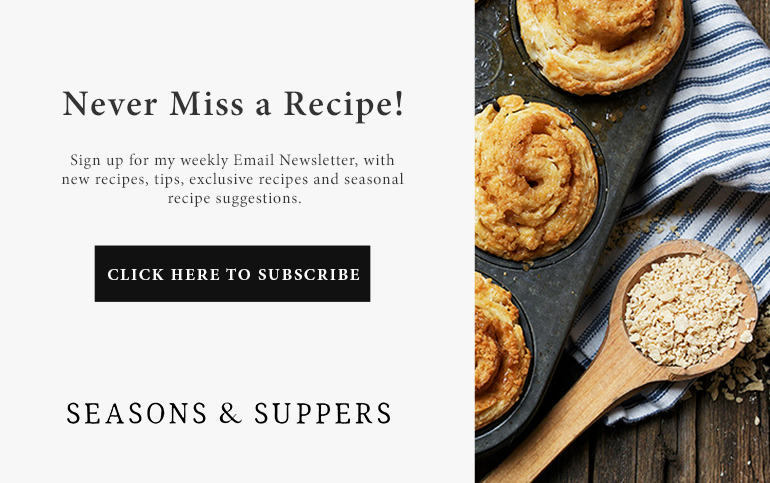 Thanks for your recipe–I will definitely be making it again! I have never left comments before. but this time I had to. I made this recipe using quorn vegetarian “chicken” steaks. My son has a poor sense of smell, therefore it affects his taste buds, so I expected the usual thanks mom, it was delicious. But this time he actually pointed out that the sauce was incredible. I also made the dish with boneless pork neck steaks, my husband loved the sauce but was not so keen on the meat. Next time I will use pork loin, it’s very expensive over here so I will wait for a special occasion. Thank you so much for the recipe. 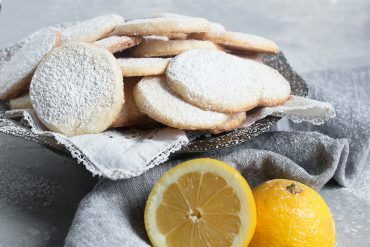 Thank you for sharing this delicious recipe, my family loved it!!! 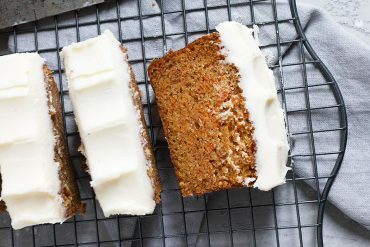 I have made this recipe so many times, and I love it just as much every time I make it! It’s a huge hit in my house. So glad to hear that, Ila. It’s a favourite here, too :) Thanks! This is my go-to whenever I have company. Everyone raves & although it’s a bit time consuming, it’s not difficult. Also, the time it takes on the stove you get to spend with your guests. And is smells divine! I am in the process of making this right now. The pork is simmering with the herbs and wine as I type. How simple the ingredients and the prep. This is my Easter supper to bring to work on my hospital shift and I am eager! Sorry for the slow reply Jacqueline, but I do hope you all enjoyed this :) Happy Easter! Made it with pork tenderloin and it was delicious! Will definitely make again. How long did you cook it for? Hi Kyla, It will depend on the size of your pork. If using the 2lb pork loin as per the recipe, it cooks about 1 1/2 hours. Pork tenderloins would be much less time. I recommend a thermometer and cooking until it reaches 140F. internal temperature. EXCELLENT!!!! Had 2 tenderloins only enough gravy for one But even without the gravy on the other it was still Excellent. Will make this again and again. My wife found this recipe this afternoon. We were tired of the same old porkloin recipes. I made it for supper and, it was fantastic. We both saved it on our IPads. Thank you for sharing this wonderful recipe. We had this for supper tonight and it was wonderful. So glad to hear :) Thanks for coming back to let me know!